April 8, 2016 – Astronomers have made great strides in discovering planets outside of our solar system, termed “exoplanets.” In fact, over the past 20 years more than 5,000 exoplanets have been detected beyond the eight planets that call our solar system home. This week, NASA’s K2 mission, the repurposed mission of the Kepler space telescope, and other ground-based observatories have teamed up to kick-off a global experiment in exoplanet observation. 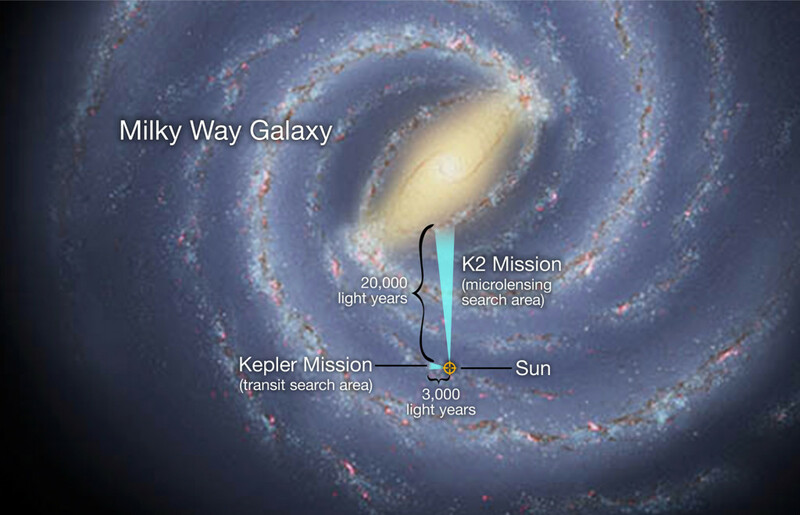 Their mission: survey millions of stars toward the center of our Milky Way galaxy in search of distant stars’ planetary outposts and exoplanets wandering between the stars. This alignment will yield a viewing opportunity of Earth and the moon as they cross the spacecraft’s field of view. On April 14 at 11:50 a.m. PDT (18:50 UT), Kepler will record a full frame image. The result of that image will be released to the public archive in June once the data has been downloaded and processed. Kepler measures the change in brightness of objects and does not resolve color or physical characteristics of an observed object.